The University Careers services have launched a new web-based system, displaying all the employability-related events and opportunities in one portal, accessible via a single login. TARGETConnect is intended to replace the previous Prospects website. According to the Head of Careers, Mark Diggles, the Prospects site had many flaws in reliability and functionality. For example, sending emails from events to many recipients was impossible. Diggles said the system would often “simply freeze and do nothing”. TARGETConnect creates a single space which allows the Base, LUSU and the Management School to publicise all the jobs, internships, workshops and lectures available to students. In the past, students had to find part-time jobs via LUSU’s job shop, graduate jobs via Base, and events mainly via their faculties. With TARGETConnect, all those notifications are made accessible in just one place. Only voluntary work is so far not included in this database of offered experience. Despite Diggles’ optimism, the opinions on TARGETConnect vary. A first year English Language student told SCAN that while searching for TARGETConnect to gain a part-time job, she accidently logged onto TARGETjobs, the graduate-jobs-only website, instead. She found the similar names misleading, and the links to the required website unclear. To access TARGETConnect, log onto the Student Portal, and click on the Careers option. From there, you can select Jobs, Internships, and Placements. The site requires that users first specify what sort of opportunity they are looking for, then they select their location. In addition, it is possible to establish business area or salary required. While giving an overview of the jobs on offer, the user has to search before finding the job they want. 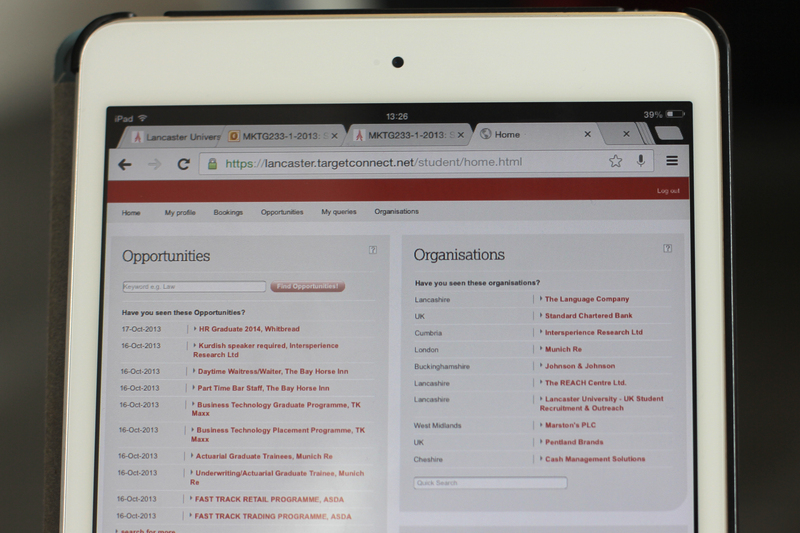 TARGET is a management software developed in conjunction with GTI and AGCAS (Association of Graduate Careers Advisory Servisec). GTI is Europe’s leading media company in graduate recruitment operating under the brand TARGET (TARGETjobs, TARGETcourses etc.) GTI attends various careers fairs, and it hands out hundreds of thousands publications promoting jobs for students, as well as holding competitions for its users. AGCAS is a professional body for careers experts working with graduates. It conducts a research on graduate labour market and delivers training and support. It creates a focal point for University Careers Services. TARGET, then, is their joint brand under which they operate together.